The App Store is groaning under the weight of tip calculators, but they're of limited usefulness. Even beautifully finished apps like Tipulator just have you enter the total of a bill from a bar or restaurant, telling it how many people are in the group, then they add a tip and split it. But what if you had soup and your friend plumped for a rib-eye steak? Or if three of you had a soft drink each, but a couple shared a bottle of wine? And what if Sandra has the correct money, but Peter only has a fifty pound note? And the tip? Shall I just leave a tenner? Bistromath solves all this. 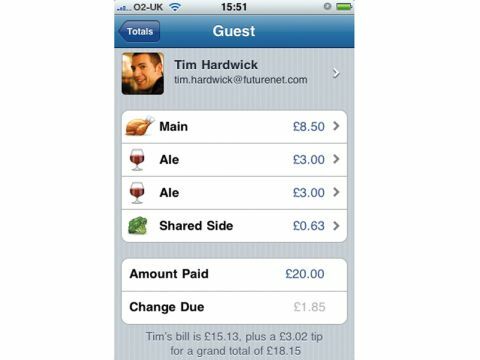 It only takes a few taps to enter the cost of the meals everyone's having – if you want to take the time, you can tap through and pick from a handful of configurable options to keep track of whether you're entering a drink, a main, a side or whatever – and the real genius comes when you realise that you can define anything as being shared among more than one person. A bowl of chips that three of you stole from? Easy. The cost is split three ways and apportioned to each of the three. You can type people's names in manually, or hook into your Contacts app to pull them in, which also shows people's photos if you've tied them into the address book database. Or you can add them in Bistromath. Once you're done, and have decided on a tip percentage, Bistromath shows you how much each person owes. Better still, you can tell it how much each person has put in the pot, and it will calculate how much change they need. You can even email receipts to the folks who were at the meal. It's a little US-centric at the moment, but it works fine in the UK. And as if that wasn't enough, up to four other people can collaborate on a bill wirelessly with no complicated setup.